Providing support to people with intellectual and developmental disabilities (IDD) can be a major source of stress for the family caregivers. It is therefore important to identify resilient and protective factors for caregivers. This study examined whether mindfulness facets predict over time fewer symptoms of anxiety and depression and better quality of life for the family caregivers of people with IDD. A sample of 143 Spanish relatives of people with IDD (122 women and 21 men), aged between 18 and 78 (M = 46.87, SD = 12.16), participated in a two-time 6-month longitudinal study. Participants completed measures of anxiety, depression, quality of life, and mindfulness facets at the beginning of the study. Six months later, they again completed measures of psychological symptoms and quality of life. The findings indicated that acting with awareness and non-reacting were the most beneficial mindfulness facets for caregivers. Acting with awareness predicted a reduction of anxiety (β = − 0.16, p < 0.01) and depression (β = − 0.17, p < 0.05) and an increase in quality of life (β = 0.19, p < 0.05) at the follow-up. Non-reacting predicted a reduction of anxiety (β = − 0.16, p < 0.05) and depression (β = − 0.13, p < 0.05) over time. 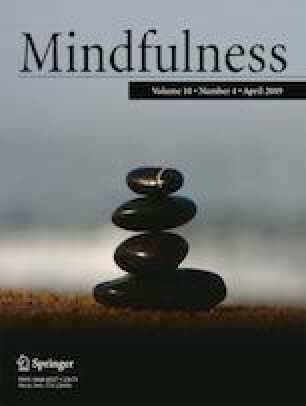 The results of the study show the beneficial role of mindfulness facets and suggest the importance of studying the effect of mindfulness-based interventions for the relatives of people with IDD. The authors thank the families and associations that gave up their time to take part in this study (Gaude, Gorabide, Amica, Asbibe School, Adicas, Aspanias, Fundación Síndrome de Down Pais Vasco, Apoyo Dravet, and others). LO: assisted with the design of the study and data analyses and wrote the paper. EC: designed the study, analyzed the data, and collaborated with the writing and editing of the paper. All authors approved the final version of the manuscript for submission. This research was funded by the Basque Country Government (Refs. PRE_2018_2_006 and IT982-16). All participants were informed and gave their consent before participating in the study. All procedures performed in studies involving human participants were in accordance with the ethical standards of the institutional and/or national research committee and with the 1964 Helsinki declaration and its later amendments or comparable ethical standards. This investigation was approved by the Ethics Committee of University of Deusto (Ref. ETK-08/15/16). Conner, C. M., & White, S. W. (2014). Stress in mothers of children with autism: trait mindfulness as a protective factor. Research in Autism Spectrum Disorders, 8, 617–624. https://doi.org/10.1016/j.rasd.2014.02.001. Curtiss, J., & Klemanski, D. H. (2014). Teasing apart low mindfulness: Differentiating deficits in mindfulness and in psychological flexibility in predicting symptoms of generalized anxiety disorder and depression. Journal of Affective Disorders, 166, 41–47. https://doi.org/10.1016/j.jad.2014.04.062. Preacher, K. J., & Coffman, D. L. (2006). Computing power and minimum sample size for RMSEA [Computer software]. Available from http://quantpsy.org. Accessed 10 Sept 2018.